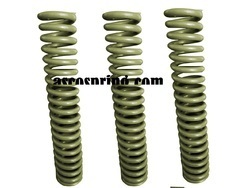 Prominent & Leading Manufacturer from Howrah, we offer custom helical springs, wire helical springs and helical springs. Asco Engineering & Enterprise. 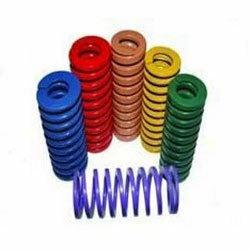 are engaged in offering a wide range of Custom Helical springs, fabricated using high grade raw material that are die casted using advanced and high tech machines. Characteristics: The gap between the successive coils is larger.It is made of round wire and wrapped in cylindrical shape with a constant pitch between the coils.By applying the load the spring contracts in action. Material Section: Round, Square, Rectangular taper, Flat or any special shape. Materials specification as per customer requirement, if required. Capacity: Bar dia. 1 mm Upto 62 mm. Out side dia. 20 mm Upto 500 mm. Free height 10 mm Upto 1500 mm. Total coils as applicable. Load bearing capacity Upto 40tons. per pc. Round, Square, Rectangular taper, Flat or any special shape. Grade: 1mm upto 12mm IS:4454Pat-1 & Part-IV and 12mm upto 62mm Silicon-Manganese steel 970/55 En-45, IS:3195 Gr.55Si7 and Gr.60Si7. Chrome - Vanadium Steel BS:970/55 En-47, IS:3195 Gr.50Cr4V2 and Gr.60Cr4V2, IS:5160, Sup-9 and SAE-4161H. Status of Finish: Shot peened, if required. Shot peening operation is followed as per IS:7001 to improve the fatigue life of spring. 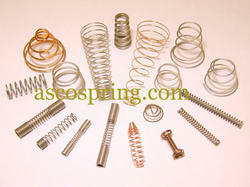 Looking for Helical Springs ?